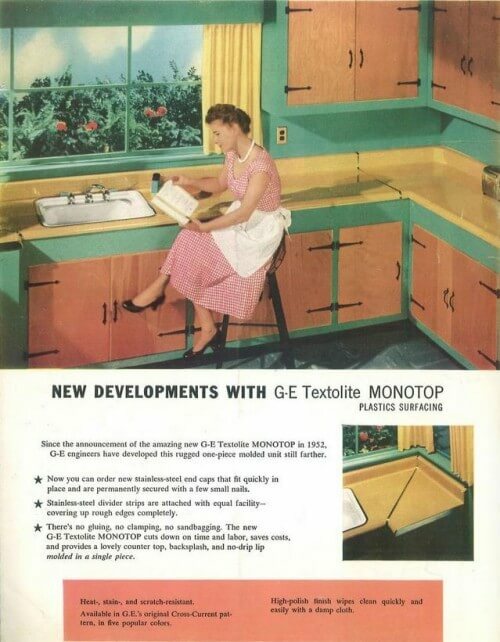 Anatomy of GE’s Monotop laminate counter top with postformed edges and backsplash: Profile view of framing, circa 1953. In the early days of the blog, I recall, there was a bit of a commenting cat fight. I showed a plaid laminate counter top with curved front edges and an integral back splash — it was all curvy, too. You know what I’m talking about — the counter has no edging on the front edge and the whole thing continues in one piece even up to and including a (typically) 4-inch backsplash. This is called “postforming” — or a “postformed counter top” — that is, when you bend the laminate to curve around edges, rather than cut it and square off everything. It’s an innovation that does not seem to have been immediately available with laminate counter tops. Not available, we presume, because it was tricky to get the laminate to curve without breaking. Back to the cat fight — which was actually between my mother (or maybe it was me, arguing on her behalf) and a reader. They disagreed on whether the curvy postformed counter top I was showing could have been from the year I said it was — like, circa early 1960s. The reader said no. My mom said yes. My mom said she HAD the counter top, in our adorable little bungalow in Carlsbad, California (the first house I ever lived in that I still remember… sweet memories.) I believed my mom — because we homeowners remember these things! Although, it is highly possible I am remembering this blog story incorrectly. Because I cannot find it on the blog. A prize to anyone who can. Are you still with me? 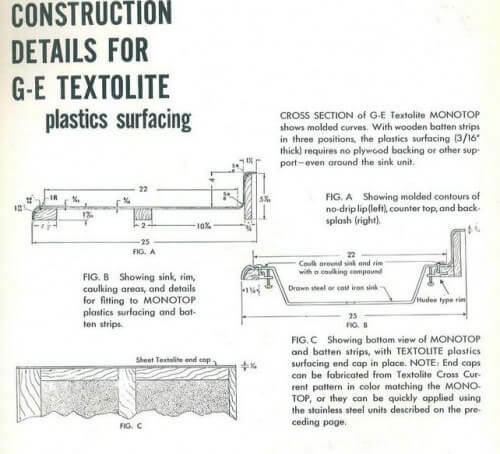 Anyway, when we recently featured a complete catalog of 1953 Textolite — I finally saw some proof of just when postformed counter tops may have begun appearing in the U.S. marketplace. 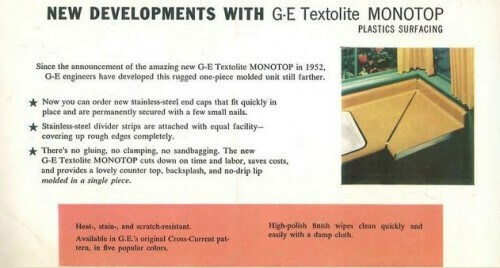 According to the catalog, GE offered its first postformed design — the GE Monotop — in 1952. 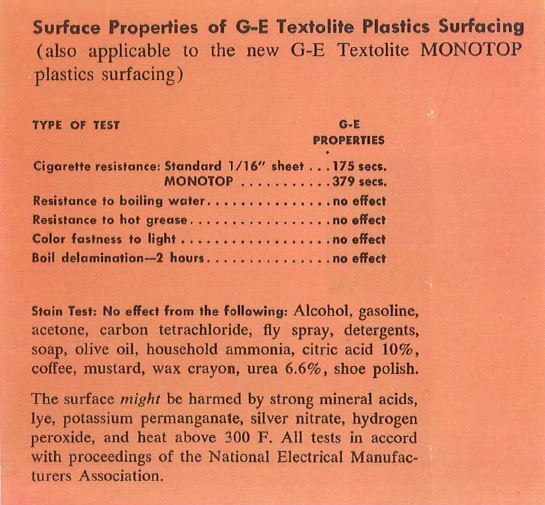 In a nut: The postformed GE Monotop counter top must have been pretty darn high-end. So who was the very first to manufacture and sell postformed counter tops? 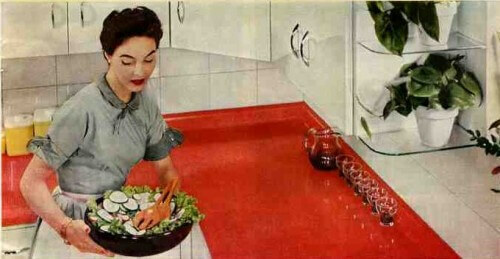 That is, which laminate maker was the very first to market with postformed counter tops? I will keep my eyes open and hope to wrestle this question to the ground one day. For now, the stake goes to GE, 1952, because of the confirmation in this catalog. 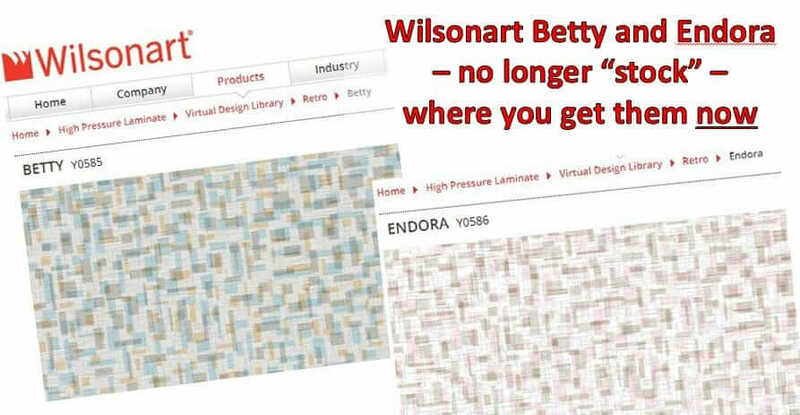 For this story, I reached out to Formica with this question, and their initial response was “late 1960s” for their company. I am skeptical of this answer, though, because once I started looking more closely through my photos of kitchens featured previously on the blog, I quickly found photos of postformed counter tops from 1954 and on. Here’s a great view of a postformed counter top that does NOT have the stainless steel divider strips. I am not sure if this was an “advancement” or whether this laminate is just thinner and therefore, more easily joined at the seams. 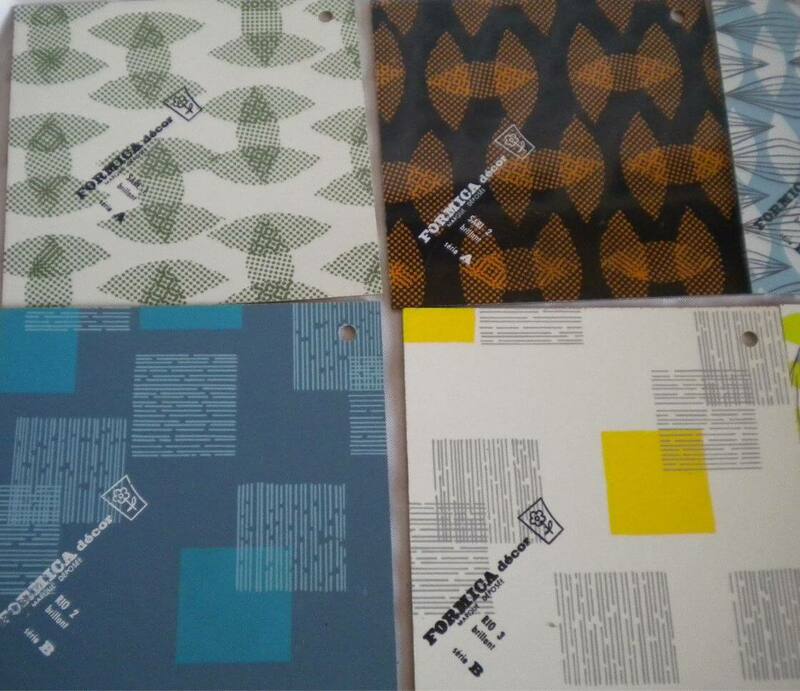 This image is from Micarta (one of the earliest laminate makers) — 1954. American Standard kitchen — yup, postformed laminate counter tops in this ad from 1954. 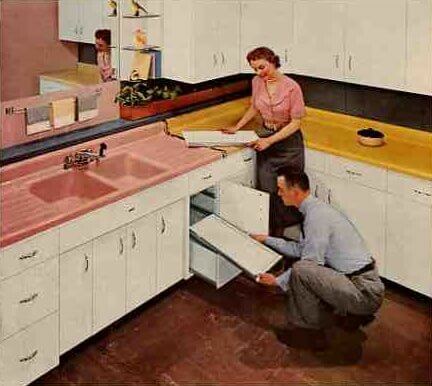 Are postformed counter tops “authentic” for 1950s houses? Suffice to say: If you are wondering, “Is it authentic for me to have a postformed counter top and back splash in my mid century kitchen?”, the answer looks to be: Starting in at least 1952, yes, postforming was available. However, I will make an educated guess — these were upscale — maybe even “the granite counter tops of their day”! Looking at the GE diagram, it appears that creating a postformed counter top took real finesse — this was a special factory order, you could not post-form this counter on-site. Note, I am talking “early days” of postforming here. On the other hand, it was relatively easy for any contractor or even an intermediately competent DIY homeowner to adhere laminate on to a flat surface and then edging the flat edges with with aluminum, stainless steel, laminate or wood. So I bet, that squared-off counter tops with edging were even more common, because of all the subdivision and tract housing that was going up across the nation. In these developments, the so-called merchant builders would have been looking to shave off pennies and dollars wherever they could. I’m betting they installed their own substrates and rolled on the the laminate themselves — finishing the whole design with squared-off edges and back splashes. All this said, by the early 1960s (again, I hypothesize), postforming became the norm. No more edging. I am guessing the technology was (1) either improved to make it cheaper or (2) the look became preferred, and as Americans became increasingly more affluent, they were willing to pay for the upcharge, no problem. Images of GE Monotop courtesy the Building Technology Heritage Library and archive.org via creative commons license. I have the original countertops, are these “postformed”? According to the 1947 catalog, “heavy battleship linoleum” was “bonded to the steel under pressure for a lifetime seal.” Unfortunately, my countertops seem to be near the end of their lifetime. At some point someone put some sort of adhesive contact paper over the linoleum, and it is not coming off too easily. The original linoleum is thick, about 3/16″ to 1/8″ inches. But there the cabinets have seen water damage and rust on the edges, the linoleum is cracking away. I’m wondering if it is worth restoring these old countertops? Should we remove the old linoleum and replace it with a similar material? If so, what? Where can we find something that thick today? Thanks so much. Love this blog, and apologies if this has already been addressed elsewhere. Tim, you can read about different countertop materials in our category Kitchens/Countertops … BUT PLEASE FIRST heed my regular warning: There may be vintage nastiness such as lead and asbestos in the old materials in our houses — get with your own properly licensed professional to assess what is in your house’s materials and layers so that you can make informed decisions. And apologies, after rereading this post, I think I am dealing with a different type of countertop entirely from what you were referring to. 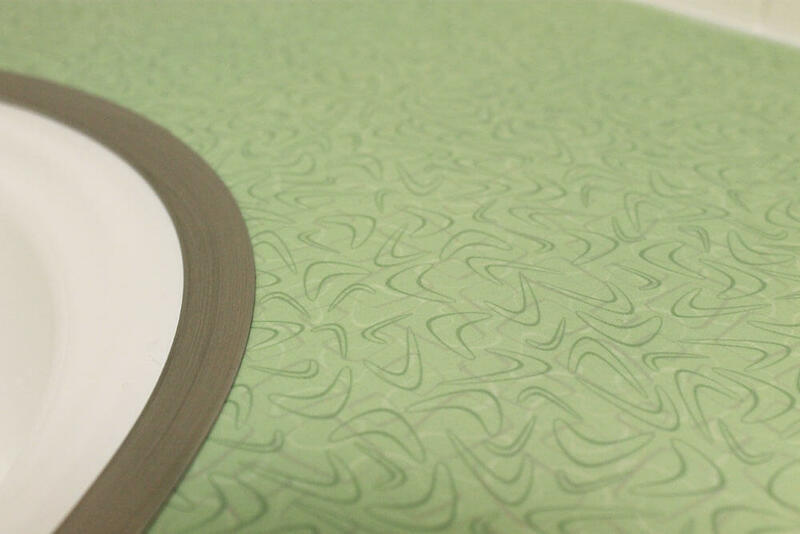 I have found a source for modern linoleum through greenbuilding supply. 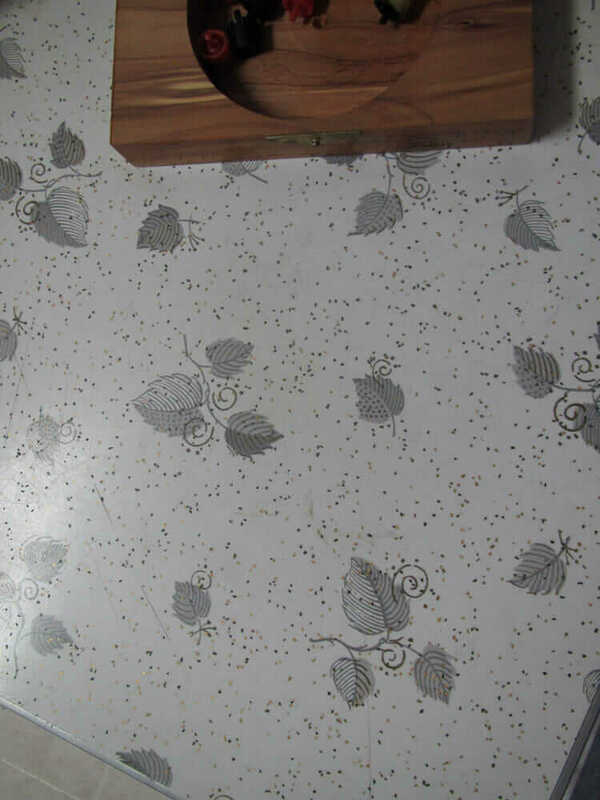 I wonder if anyone else has tried restoring these late forties countertops as I’m thinking of doing? Sorry, Tim, but I’m pushing back again. This is not a DIY site per se, where readers offer DIY advice. Also, I know what kind of countertop you are referring to and my advice stands — before you start messing with that material and with the adhesives involved, get yee an expert who can help you know what you are working with.